The End of Blade Servers? Personal Cassette Players. Portable CD players. Dial up Internet. Betamax. The VCR. Pagers. These are all popular technologies that have gone away. When they were hot, you would never have expected for them to one day be extinct. Are blade servers set to follow in the footsteps of these other blade technologies? Mid year of 2009, HP introduced their “scalable” line of servers with the HP ProLiant SL6000 family that provided users with the ability to have 4 Intel based servers inside of a 2U form factor. Designed to be a low cost compute power offering, the HP ProLiant SL6000 was my first glimpse into what could be the beginning of the end of blade servers. Why? 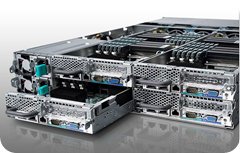 The SL6000 family shared power and cooling – just like blade servers. I’m not sure if the scalable line of HP ProLiant servers has been a huge success (or a failure) but offers it gives HP another way to reach out to customers’ needs. Fast forward to 2010. Dell introduces the Dell PowerEdge C Server line. Geared toward cloud computing, Web 2.0 environments and high performance computing (HPC), the PowerEdge C Server appeared to compete head to head with the HP ProLiant SL family. Like the HP offering, the Dell PowerEdge C Servers offered multiple server nodes in a small, 2U footprint with shared cooling and power. From a competitive comparison, there are probably a few differences, but overall they are close enough to be equal. A few weeks ago, Dell covertly released a new offering to their PowerEdge C Server line that pushes the border between blade servers and “scalable” rack server. 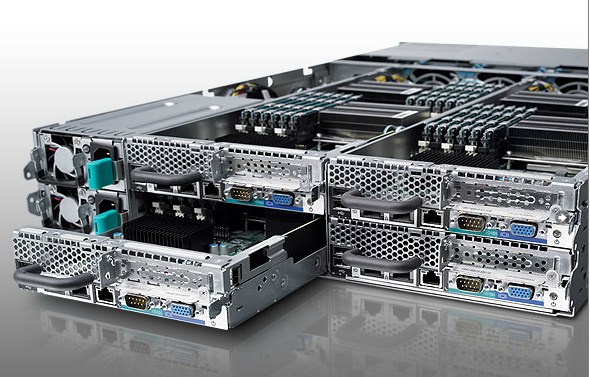 The Dell PowerEdge C5000 Chassis, coupled with Dell PowerEdge C5125 Microserver offers the ability to have 12 compute nodes within a 3U space. This means in a 42U rack, the PowerEdge C5100 line could provide 672 cores of Intel CPUs. 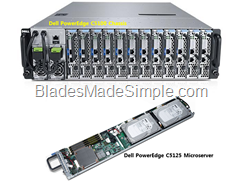 The Dell PowerEdge C5125 “microserver” is just that – a micro server that is limited to 1 single CPU, 4 memory DIMMs and up to 4 x 2.5” drives. It’s not a powerhouse server, but it provides CPU compute power. To put this into perspective, Dell’s M610 blade server maxes out at 768 cores per 42u rack. As you can see, the Dell PowerEdge C5000 family offers a very close comparison using scaled back microservers. Hopefully, you can see my point of view of this blog post. We now have manufacturers offering higher density servers sharing power and cooling in a small footprint which infringes on some of the value that blade servers bring. Will this be the end of blade servers, probably not, but as technology continues to advance, maybe one day we’ll have one design offering the best of both the rack server and blade server worlds. One day.